Anytime I can mix my two loves of history and photography, I’m a happy camper. El Paso, Texas has three Spanish missions that are literally hundreds of years old. It seems the historically “old” buildings that are east of the Mississippi get all the press but these old missions seem almost forgotten. “During the 16th century, El Paso became an important stop for Spanish explorers on their way to New Mexico to find riches and convert the native population to Christianity.” After 1609, “El Paso became a critical point” for “communication and trade between the Mexican interior and the missions and Spanish settlements of New Mexico. (1) These Spanish Missions were the hubs of their communities more than 160+ years before there was a United States. Today all three of these missions, which replaced their predecessors, are on the U.S. National Register of Historic Places for what is now called the El Paso Mission Trail. Each mission has very cool architecture yet each are a very different in their own way. I thought it would be fun to shoot all three missions together and post them as a collection with each titled simply with the time they were photographed. Black & White photography is something I’ve been working on and this seemed to lend itself well to these missions. I headed out on the morning of December 26, 2015 for my little project. This photo was the first mission I shot that morning, it is the Ysleta Mission and the photo is called 10:07 AM. I really tried to emphasize the old bell in front without blurring out the church itself. I love this 16-35mm lens because you can get right up on your subject yet still have room in the photo for other interesting items. The Ysleta Mission “is considered the first and oldest mission established in the State of Texas and the second oldest continually active parish in the United States.” The first and second structures were washed away from floods, this building was built in 1851. (2) 10:07AM was shot with a Canon EOS 6d, EF 16-35mm f/4 L IS USM at f/13, 1/25 sec, focal length of 16mm, and ISO 100. My final stop that day was at the San Elizario Mission for this photo called 10:50 AM. Like the others, a “flood destroyed the chapel and a new building was erected in the 1840’s.” (4) Of the three mission, I like to photograph this mission the best because of its architecture and the way it catches light and projects shadows. This mission sits in the heart of a historic district as well as an art district making it an interesting visit. 10:34 AM was shot with a Canon EOS 6D, Canon EF 24-105mm f/4 L IS USM at f/13, 1/125 sec, a focal length of 50mm, and ISO 100. When in El Paso, be sure to visit the Mission Trail as the buildings are truly worth seeing. Without hustling too much, I was able to shoot these three photos within one hour but I’d allow a good 2-3 hours if you wanted to view the interiors and the surrounding area of the San Elizario Mission which is part of the San Elizario Historic District. Every time I return to El Paso I make time to head out to the missions, there is always something new to photograph. The interior ceiling of the Socorro Mission on El Paso’s Mission Trail. 1. 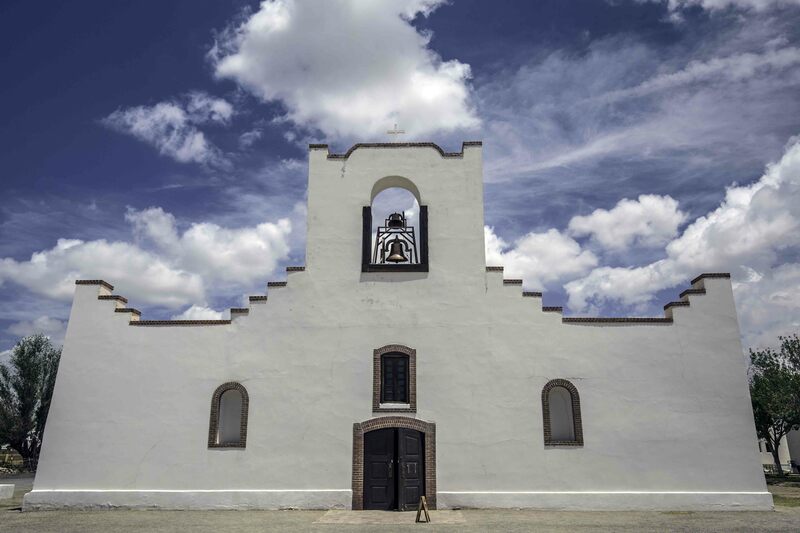 Texas Beyond History, El Paso Missions, 2016, http://www.texasbeyondhistory.net/paso/ (accessed February 21, 2016). 2. El Paso Mission Trail, Ysleta Mission, 2016, http://www.visitelpasomissiontrail.com/history/ysleta-mission-1.html (accessed February 20, 2016). 3. El Paso Mission Trail, Socorro Mission, 2016, http://www.visitelpasomissiontrail.com/history/socorro-mission-1.html (accessed February 20, 2016). 4. 2. El Paso Mission Trail, San Elizario Mission and Presidio, 2016, http://www.visitelpasomissiontrail.com/history/socorro-mission-1.html (accessed February 20, 2016).